Shure SE425 review | What Hi-Fi? Let’s not beat around the bush, eh? These are fantastic. Five stars. Next, please…? So what’s their recipe for success? It’s all in the detail. And we mean that literally and figuratively: get some music going and it’s as if the Shures disappear, leaving you with just their sound. To say it’s immersive is an understatement. The level of finesse on offer is astonishing even at this price: you’ll hear things you never thought were there even on recordings you know inside out. Play Icebreaker’s version of Brian Eno’s Apollo (the soundtrack to the fantastic moon-landing documentary For All Mankind) and the ebb and flow of the ambient tunes is mesmerising – you just don’t get that on most other pairs of in-ears. They’re energetic, too. Coming back down to earth with the altogether less sophisticated Suzi (Wants Her All Day What?) by Extreme shows the SE425s to be more than capable of handling tight rhythms and punchy rock. The attack of Nuno Bettencourt’s guitar pick is especially evident, but we like the fact that they never tip over into brashness. It would be easy to overcook the top-end in the name of excitement, but Shure has kept just enough of a lid on it to create space and fun without making it feel like someone’s squirted lemon juice into your ears. The midrange performance is as solid as you like – that vein of detail continues all the way down the frequency range. Vocals are nuanced and placed to the fore, yet they never conflict with other elements in the same frequency range. Move down to the bass and, while the Shures don’t pack as much of a punch as the likes of the Sony XBA-2iPs or Klipsch Image X7is, there’s still a decent amount of thud. The sense of isolation helps with low-frequency extension too – these really do block out almost everything around you, keeping it all locked inside your head. The looks might not appeal to everyone. Shure has gone for the pro-style in-ear monitor configuration, where the cable passes up your back and splits behind your head before passing over the top of your ears, secured in place with a cable slider and flexible wire inserts that mould to your ear-shape. They can be a bit annoying to put in (especially if you go for the foam tips which, while offering splendid isolation, need time to fit themselves to your ear canal), but the results are worth it. If you've a bit more money to spend, though, you could get custom ear-tips made to speed things up (and stop your friends covering your beloved buds in their earwax). 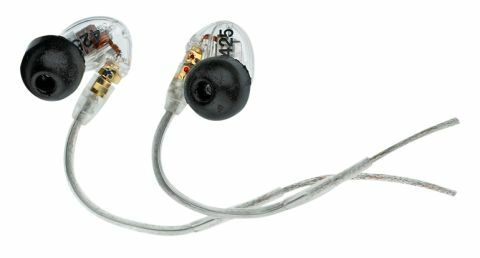 The SE425s have detachable enclosures – which means if the cable breaks, you can replace it for less money than buying a new set of earphones. The enclosures also swivel on the ends of the cables, making them easier to fit and more comfortable to wear. The standard SE425s don’t have a remote or mic unit, but you can buy separate ones (there’s a three-button version for Apple devices and a one-button model for everything else). So, what else is there left to say? Not a lot, really. We think the Shure SE425s are great. They might not wow your peers on the catwalk, and yes, they could do with a smidge more punch in the bass, but that’s nitpicking for what really are the finest in-ears we’ve ever heard at this price.